When to post, and for which audience ? Craig Van Korlaar, owner of topnonprofits.com (a « place to publicly learn from and with the best nonprofit organizations & leaders ») produced a social media posting guide. He asked Pegasus Data to provide a french translation. 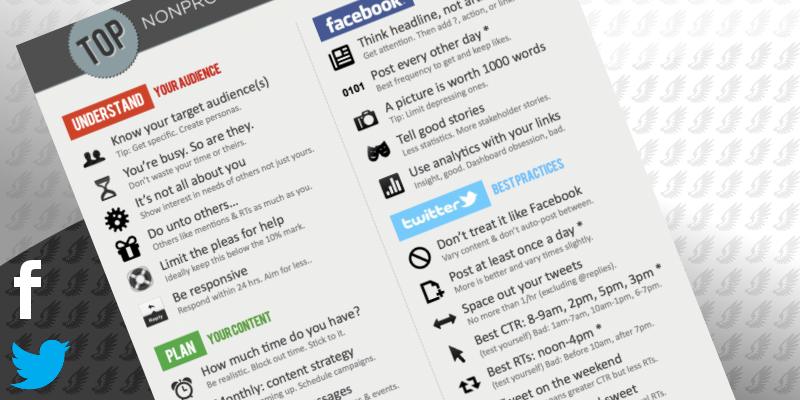 Find this resource on it original page : Social media posting guide. Tip: Get specific. Create personas. You’re busy. So are they. Don’t waste your time or theirs. Show interest in needs of others not just yours. Others like mentions @ RTs as much as you. Ideally keep this below the 10% mark. Respond within 24hrs. Aim for less. Be realistic. Block out time. Stick to it. ID what’s coming up. Schedule campaigns. Define key messages for campaigns & events. Maximize time. Minimize mental gear shifts. Tip: vary timing slightly and avoid :00 and :30. If only 2x, then mid morning & late afternoon. How will you measure success ? Tip: set measurable goals. Track progress. Get attention. Then add ?, action, or link. Best frequency to get and keep likes. Less statistics. More stakeholder stories. Insight, good. Dashboard obsession, bad. Vary content & don’t auto-post between. More is better and vary time slightly. No more than 1/hr (excluding @replies). (test yourself) Bad: 1am-7am, 10am-1pm, 6-7pm. (test yourself) Bad: before 10am, after 7pm. Less busy means greater CTR but less RTs. Below 125 characters allows manual RTs. (+) tweets shared 34% more, (-) 13% less. Highest probability of CTR. Very end OK also.